Phylogenetic analyses using mitochondrial DNA sequences of several kinds of beetles have shown that their evolution included a silent stage in which no morphological changes took place. We thus propose a new category of evolutionary process called “silent evolution”. It has been generally accepted that evolutionary processes can be divided into (1) gradual and slow changes in morphology so long as environmental conditions are kept under nearly steady state, and (2) rapid morphological changes upon drastic environmental switchovers.1) It should be pointed out that this generally accepted view is largely based on observations of the morphological characteristics of fossils and/or present-day organisms without taking into account molecular evolutionary aspects. Su et al.2) and Osawa et al.3) used phylogenetic trees based on mitochondrial as well as nuclear DNA sequences to discuss the evolutionary processes of the carabid ground beetles and did not distinguish between stagnation and slow evolution. Subsequent closer examination of phylogenetic trees has made it clear that these two processes should better be distinguished from each other. We propose a new category called “silent evolution” for stagnation of the evolutionary process. Slow or continuous evolution from a non-deleterious but non-neutral point mutation or minor modification of genomic DNA may cause some morphological and functional phenotypic changes. Silent evolution differs from slow continuous evolution by an apparent absence of morphological changes. This, however, does not mean that there are no changes in the mitochondrial and nuclear genomes. Let us assume that a single (or multiple) branching of a certain species lineage took place, producing more than two sublineages with indistinguishable resultant morphology in the offspring. In each sublineage, mutations (mostly neutral) are present in either the mitochondrial or nuclear DNA at about the same intervals but at different sites. This produces the situation of having nearly the same number of mutation sites among different lineages but with different base sequences, although the base substitutions of mitochondrial DNA occurs at a rate 5 to 10 times more than nuclear DNA. Several genera and species of the carabid ground beetles and the Nicrophorus group of burying beetles were used in this study (Table 1). The ND5 gene sequences of carabid beetles were determined in our previous studies,3) and the COI and COII gene sequences of Nicrophorus were retrieved from NCBI GenBank databases.4) The DNA sequences for each region were aligned using MAFFT software.5) Phylogenetic analyses were performed on MEGA66) with UPGMA, neighbor-joining (NJ), and maximum-likelihood (ML) methods with 1000 bootstrap replications. The UPGMA trees were used in this paper, as no discrepancies were found among the trees produced by all of the above methods. For divergence time, 3.6 million years (Myr) per 0.01 pairwise Kimura-two parameter distance was used throughout.2),3),7) Since the rate of base substitution of COI and COII of the burying beetles is different from that of ND5, and is unavailable for us, only relative evolutionary distances were shown in the Fig. 4. Silent evolution may be best explained by examining the phylogenetic tree of Damaster blaptoides (s. lato). This ground beetle is endemic to the Japanese Islands and strictly carnivorous throughout its habitats and is unable to fly due to regression of hind wings. The mitochondrial molecular clock evidence suggests the phylogenetic diversification at about 15 million years ago (Mya), coinciding with the early period of the formation of the Japanese Islands. The ancestor of this beetle was an inhabitant of the eastern periphery of the Chinese continent. Paleomagnetic evidence indicates that ancient Japan broke off from the Chinese continent at about 15 Mya, after which the northeast and southwest Japan arcs became separated as a consequence of the double-door opening of the Sea of Japan. Then the proto-Japanese Islands took on the shape of an archipelago as a result of submergence. By this event, the southwest arc was not much affected, but the land area of the northeast arc remained only as scattered multi-islands. Thus, the proto-Damaster beetles were separated to the southwest and northeast populations. Following the formation of the archipelago, an extensive upheaval, especially of the northeast arc, occurred. The two arcs were then reunited to form the present Japanese Islands.8) The present Damaster fauna was established in a manner reflecting the geographic history of the formation of the Japanese Islands.7) Morphological differences among the southwest populations, i.e., inhabitants of Kii Peninsula (KII), Chugoku-Shikoku (WJN), and Kyushu (KYU) cannot be recognized, and these populations are treated as being of the same subspecies, D. blaptoides blaptoides (Fig. 1). (For subspecies inhabiting eastern and central Japan, see footnote). This treatment is based on the Ishikawa’s extensive morphological studies of body color, detailed structures of male genital organ, head, prothorax, elytra, etc. for all Damaster subspecies. His work was well summarized in 1986.9) Ishikawa concluded that inhabitants of Kinki, Chugoku-Shikoku, and Kyushu are morphologically indistinguishable from one another and treated them as belonging to the same subspecies, Damaster blaptoides blaptoides. Especially notable is the complete absence of the ciliated plate underside of male protarsus, which exists in the eastern subspecies. The function of the ciliated plate is not known. There might be some relation between their morphological structures and environments where they live. The eastern subspecies live on the forest ground and in the rotten tree where they hibernate, while the southwest D. blaptoides blaptoides individuals are found on the forest ground and hibernate in soil cliff. The relationship between the morphological differences mentioned above and their environmental conditions might be meaningful from the ecological view point. We then follow the Ishikawa’s conclusion that the inhabitants of above three districts belong to the same subspecies, Damaster baptoides blaptoides. 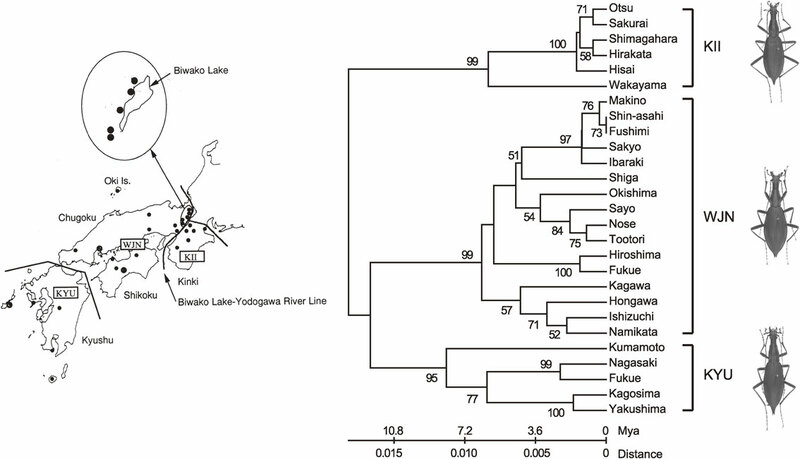 Phylogenetic tree (UPGMA method) of ND5 gene sequences from three lineages of D. blaptoides blaptoides in southwest Japan. KII: Kii Peninsula lineage, WJN: southwest lineages and KYU: Kyushu lineage. Black circles indicate the localities of specimens examined. However, a mitochondrial phylogenetic tree of Damaster blaptoides blaptoides clearly shows three locality-dependent lineages (Fig. 1). Presumably, neutral base changes have occurred at independent sites in each lineage. Since morphology of all populations of D. b. blaptoides is indistinguishable, mutations on the nuclear genes required for morphogenesis of this beetle must have remained unchanged during evolution. In other words, the morphogenesis of D. b. blaptoides was under tight (but stable) selection pressure throughout the entire evolutionary process. This example may be generalized as follows. A population of a given species is separated by geological events such as the formation of river(s), mountains, etc., and the morphology and functions of the species in the new region(s) does not change, so far as the selection pressure remains unchanged from that before the branching event. When a development of a new species from the maternal line of the phylogenetic tree takes place, mutation(s) of nuclear gene(s) primarily causing advantageous (or near-neutrally modified) characters should occur. By contrast, once mutations causing morphological changes with a lower adaptability occur, such individuals are selected out. * The phylogenetic profiles of the Damaster beetles of northeast and central Japan show five independent lineages (which roughly coincide, with Ishikawa’s subspecies), showing some morphological as well as color variations not only among these lineages but also within each lineage. These variations could be caused by a complicated geohistory.7) Therefore, these northeastern populations are not discussed here. There are other examples of silent evolution. Euleptocarbus porrecticollis is a carabid beetle endemic to the mainland of Japan (Honshu). Taxonomists divided this species into two subspecies, E. p. porrecticollis and E. p. kansaiensis as shown in Fig. 2 based on morphologically distinguishable characteristics. A phylogenetic tree of mitochondrial ND5 gene is much more complex than indicated by morphology alone (Fig. 2).10) A large cluster of Tohoku, Kanto, and Chubu districts (TKC) occupies the eastern part of Honshu, which has three subclusters. Morphology is indistinguishable among members of sublineage in the TKC, suggesting that the present-day TKC members are the descendants of at least more than one lineage. The presence of subclusters is also evident for E. p. kannsiensis, which is composed of two large clusters of Kansai district in central Japan (KNS) and Chugoku district in western Japan (CHK), and the KNS appears to be composed of three sublineages. Although the members of KNS and CHK are morphologically indistinguishable, they are located in clearly separate clusters on the molecular phylogenetic tree, indicating silent evolution. Phylogenetic tree of ND5 gene sequences from E. porrecticollis. TKC: E. porrecticollis porrecticollis lineage in the northeastern half of Honshu. KNS: E. porrecticollis kansaiensis lineage in the Kinki district. 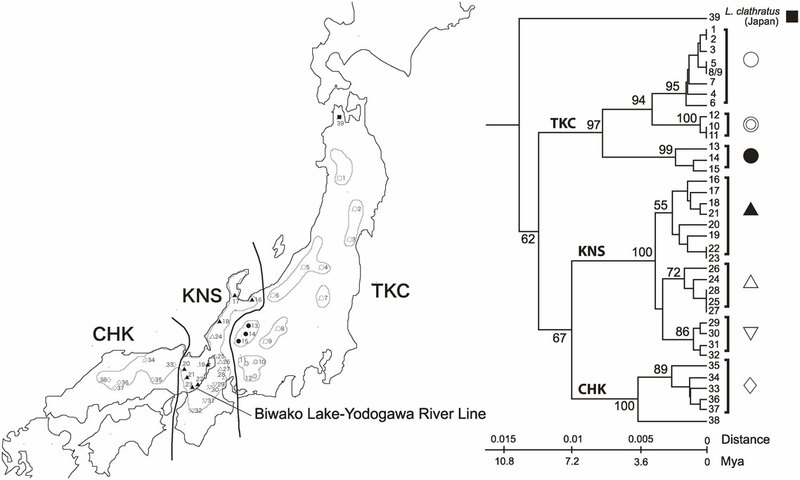 CHK: E. porrecticollis kansaiensis lineage in southwest Honshu. Symbols and numbers correspond to those in the phylogenetic tree. There are additional examples of silent evolution in carabid beetles. (1) Members of Tomocarabus opaculus and its related species are distributed on the Eurasian continent and in Japan. The genus originated nearly 40 Mya and was separated into several species about 30 Mya.2) One of these species, T. opaculus, divided to several lineages about 20 Mya,2),11) but the descendants are indistinguishable based on morphology. Other two Tomocarabus species, T. fraterculus and T. convexus also underwent further divisions but remain indistinguishable on morphology.2) (2) Phricocarabus glabratus is a carabid species with wide distribution in Europe. The ND5 phylogenetic tree shows that populations of this species were separated into two lineages about 20 Mya without morphological changes,2),12) coincident with the formation of the Alps. (3) A carabid beetle, Apotomopterus sauteri, is distributed in the southwest regions of China, including Taiwan. The ND5 phylogenetic tree of specimens from a wide range of localities shows that this species originated about 30 Mya, followed by branching into several lineages about 20 Mya.13) No morphological differences can be recognized among all descendants with the exception of branching of an allied species, A. huppensis, from one of the sauteri–lineages (Fig. 3). This phenomenon will be discussed later. Phylogenetic tree of ND5 gene sequences from A. sauteri and A. huppensis using A. kouitii as an outgroup. Numbers on phylogenetic tree correspond to the locality numbers on the map. Photographs: 1 and 2, A. sauteri; 3, A. huppensis. Using several mitochondrial genes, Mousseau and Sikes4) constructed a phylogenetic tree of burying beetles of the Nicrophorus group (Silphidae) from Southeast Asia and East Asia, including Japan and New Guinea. 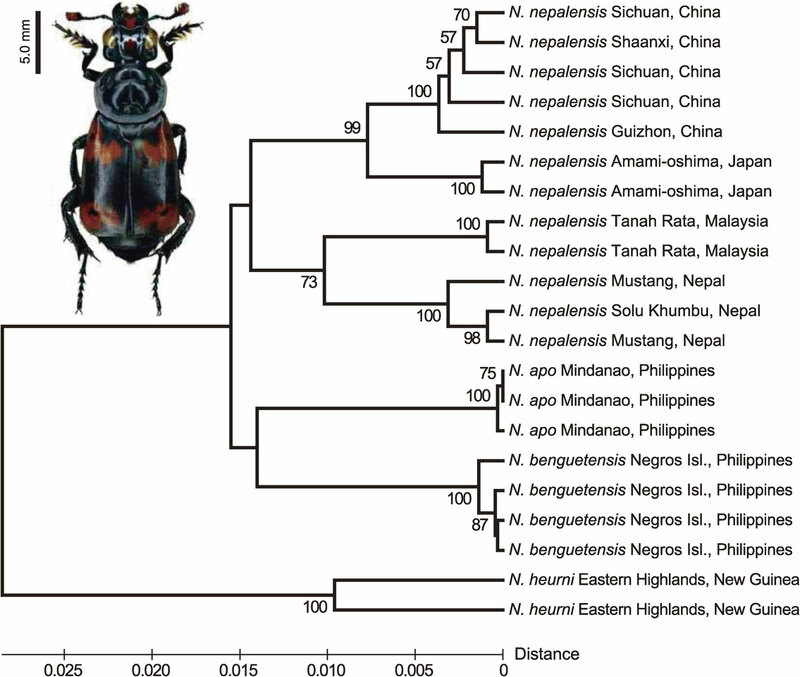 The tree clearly indicates that among several Nicrophorus species, a considerable number of locality-linked lineages are recognized in N. nepalensis (Fig. 4). The tree shows that this species was first divided into two lineages, a China-Japan lineage and a Nepal-Malaysia lineage, followed by further separation to Chinese and Japanese sublineages and Nepalese and Malaysian sublineages, respectively. There are no morphological differences among the descendants of these sublineages. Phylogenetic tree (UPGMA method) of mitochondrial COI and CO2 gene sequences from the N. neparensis group. The sequences data are from Moussecau and Sikes (2011)4) and were retrieved from NCBI GenBank database. Photograph: N. neparensis. The examples enumerated to this point demonstrate the silent period of evolution without accompanying morphological changes. Such silent evolution appears to occupy long periods of time in evolution under stable selection pressure. The next problem to consider is how new species emerges during evolution without undergoing big morphological changes caused by moderate environmental changes. As shown in Fig. 3. A. huppensis, which is quite similar in morphology to A. sauteri, emerged from one of the A. sauteri lineages. The similarity of these two species is not due to the difference of male and female, because the species identification was all done using male specimens for examination of male genital organ. This new species might be formed by non-neutral but non-deleterious (point) mutations with little connection to the environmental differences between A. sauteri and huppensis because of no recognizable barriers. Morphological differences between the two species are small, but is distinguished from each other by elytral surface sculpture and male genital organ. Finally, we note two examples where the evolutionary histories do not necessarily demonstrate silent evolution. A winged carabid beetle, Calosoma chinensis, is widely distributed on the eastern half of the Eurasian continent. The molecular phylogenetic tree of this species reveals no lineage branching.14),15) Similarly, a dragonfly, Orthetrum poecillopus, is distributed in southeast China and Miyajima, Japan, but the molecular phylogenetic tree shows no branching.16) Evolution of these two species, at first glance, follows the pattern of silent evolution. However, it is misleading to consider these as following silent evolution. The two species are winged and seem to have no geographic or other barriers. Therefore it is probable that their phenotypes are indistinguishable due to free exchange of genetic materials across eastern half of Europe (C. chinensis) and across China and Japan (O. poecillopus). The molecular phylogenetic analyses of a number of beetles suggest that silent evolution occupies a larger fraction of the evolutionary timescale than do the phases of creation of allied species and discontinuous appearance of species having unique characters. 1) Stanlay, S.M. (1981) The new evolutionary time table. In Fossils, Genes, and Origin of Species, Basic Books, New York. 2) Su, Z.-H., Imura, Y. and Osawa, S. (2001) Evolutionary discontinuity of the carabine ground beetles. J. Mol. Evol. 53, 517–529. 3) Osawa, S., Su, Z.-H. and Imura, Y. (2004) Molecular Phylogeny and Evolution of Carabid Ground Beetles, Springer Verlag, Tokyo. 4) Mousseau, T. and Sikes, D.S. (2011) Almost but not quite a subspecies: a case of genetic but not morphological diagnosability in Nicrophorus (Coleoptera: Silphidae). Biol. J. Linn. Soc. 102, 311–333. 5) Katoh, K., Kuma, K., Toh, H. and Miyata, T. (2005) MAFFT version 5: improvement in accuracy of multiple sequence alignment. Nucleic Acids Res. 33, 511–518. 6) Tamura, K., Stecher, G., Peterson, D., Filipski, A. and Kumar, S. (2013) MEGA6: Molecular Evolutionary Genetics Analysis version 6.0. Mol. Biol. Evol. 30, 2725–2729. 7) Su, Z.-H., Tominaga, O., Okamoto, M. and Osawa, S. (1998) Origin and diversification of hindwingless Damaster ground beetles within the Japanese islands as deduced from mitochondrial ND5 gene sequences (Coleoptera, Carabidae). Mol. Biol. Evol. 15, 1026–1039. 8) Tominaga, O., Su, Z.-H., Kim, C.-G., Okamoto, M., Imura, Y. and Osawa, S. (2000) Formation of the Japanese Carabina fauna inferred from a phylogenetic tree of mitochondrial ND5 gene sequences (Coleoptera, Carabidae). J. Mol. Evol. 50, 541–549. 9) Ishikawa, R. (1986) Phylogeny and subgeneric classification of the genus Damaster Koller (Coleoptera, Carabidae). Ent. Pap. Pres. Kurosawa, Col. Assos. Japan. pp. 115–130. 10) Kim, C.-G., Tominaga, O., Su, Z.-H. and Osawa, S. (1999a) Origin and diversification of Euleptocarabus porrecticollis (Coleoptera, Carabidae) in the Japanese islands inferred from mitochondrial ND5 gene sequences. Mol. Phylogenet. Evol. 13, 440–444. 11) Su, Z.-H., Tominaga, O., Saito, S., Kim, C.-G. and Osawa, S. (2000) Phylogeny of Tomocarabus opaculus (Coleoptera, Carabidae) as deduced from mitochondrial ND5 gene sequences. Elytra, Tokyo 28, 13–20. 12) Imura, Y., Su, Z.-H., Kim, C.-G. and Osawa, S. (1998) Reorganization of the Oreocarabus complex (Coleoptera, Carabidae) based on endophallic morphology and molecular phylogeny. Elytra, Tokyo 26, 223–248. 13) Kim, C.-G., Su, Z.-H., Imura, Y. and Osawa, S. (1999b) Origin and evolution of the Apotomopterus ground beetles (Coleoptera, Carabidae) as deduced from mitochondrial ND5 gene sequences. Elytra, Tokyo 27, 643–649. 14) Su, Z.-H., Imura, Y. and Osawa, S. (2005) Evolutionary history of the Calosomina ground beetles (Coleoptera, Carabidae, Carabinae) of the world as deduced from sequence comparisons of mitochondrial ND5 gene. Gene 360, 140–150. 15) Tominaga, O., Su, Z.-H. and Osawa, S. (2015) Evolutionary history of a carabid ground beetle, Campalita chinense inferred from a molecular phylogenetic tree. Insect DNA Res. Newsletter 23, 35–39 (in Japanese). 16) Tominaga, O., Kagimoto, B., Mizuta, K., Su, Z.-H. and Osawa, S. (2008) Evolutionary history of a dragonfly, Orthetrum poecilops. Insect DNA Res. Newsletter 9, 33–52 (in Japanese).